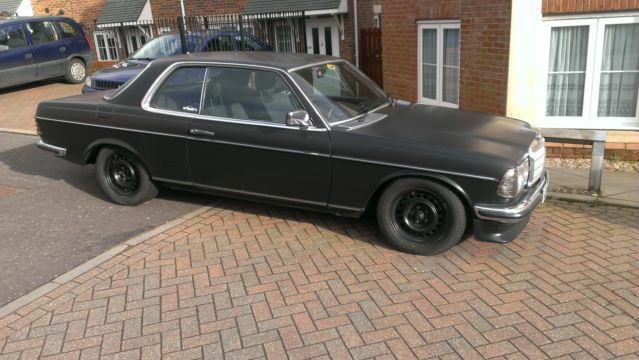 I adore old Mercs and have owned two W124s and a 190e. One model I have yet to own (and will do one day) is the classic W123. It’s everything a car should be – reliable, pretty, vintage looks with modern functions. With its signature grille, it looks like a car should look. Its dimensions are perfect – not too big and not too small. As a coupe it has a sporty kind of quality to it, yet its boxy appearance suggests tank-like robustness. So back in the day the W123 was a good looking luxury car, a car that has transcended virtually all other cars of its era in managing to remain every bit as good looking as it was back in the 80s. Because of its tank-like robustness, there are a fair few still around to choose from, and from my experience with old Mercs, all of their electrics will still be working and the ride will be silent and smooth. Here at Gargling Gas we also like cars with personality because, “Cars have feelings too”. Don’t get me wrong, this car has a big personality, but I’m talking about the human touch. Slammed cars are cool, and the rat look is also a great way of transforming the right car into something with real presence… like the W123 230ce pictured above. Not a particularly fast car, the 230ce produces enough grunt from its 2.3-L engine to cruise along with ease. The owner of this one has simply dropped it, given it the matte black finish, and painted its steel rims black. It’s a cheap way of completely transforming a car’s look, but it’s very affective. If I wasn’t committed with another upcoming drift project, I’d snap this up, happy in the knowledge I was cruising around town in hitman/serial killer style.